(PhysOrg.com) -- NASA's Mars Reconnaissance Orbiter has discovered the total amount of atmosphere on Mars changes dramatically as the tilt of the planet's axis varies. This process can affect the stability of liquid water, if it exists on the Martian surface, and increase the frequency and severity of Martian dust storms. 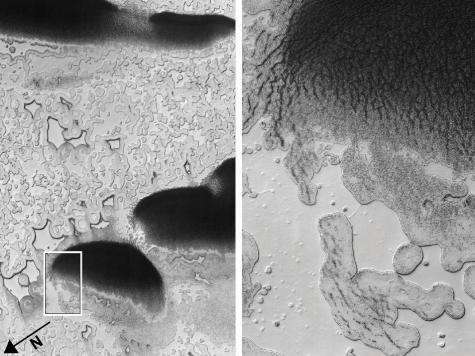 Researchers using the orbiter's ground-penetrating radar identified a large, buried deposit of frozen carbon dioxide, or dry ice, at the Red Planet's south pole. The scientists suspect that much of this carbon dioxide enters the planet's atmosphere and swells the atmosphere's mass when Mars' tilt increases. The findings are published in this week's issue of the journal Science. 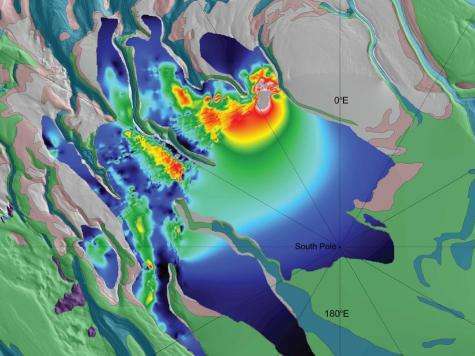 The newly found deposit has a volume similar to Lake Superior's nearly 3,000 cubic miles (about 12,000 cubic kilometers). 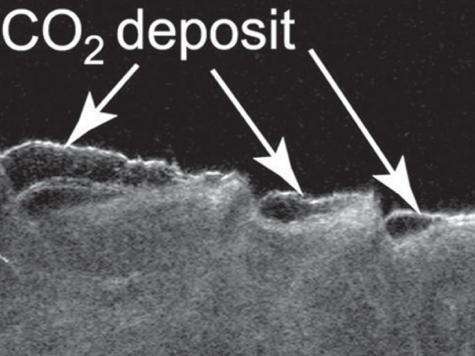 The deposit holds up to 80 percent as much carbon dioxide as today's Martian atmosphere. Collapse pits caused by dry ice sublimation and other clues suggest the deposit is in a dissipating phase, adding gas to the atmosphere each year. Mars' atmosphere is about 95 percent carbon dioxide, in contrast to Earth's much thicker atmosphere, which is less than .04 percent carbon dioxide. "We already knew there is a small perennial cap of carbon-dioxide ice on top of the water ice there, but this buried deposit has about 30 times more dry ice than previously estimated," said Roger Phillips of Southwest Research Institute in Boulder, Colo. Phillips is deputy team leader for the Mars Reconnaissance Orbiter's Shallow Radar instrument and lead author of the report. "We identified the deposit as dry ice by determining the radar signature fit the radio-wave transmission characteristics of frozen carbon dioxide far better than the characteristics of frozen water," said Roberto Seu of Sapienza University of Rome, team leader for the Shallow Radar and a co-author of the new report. Additional evidence came from correlating the deposit to visible sublimation features typical of dry ice. The Shallow Radar, one of the Mars Reconnaissance Orbiter's six instruments, was provided by the Italian Space Agency, and its operations are led by the Department of Information Engineering, Electronics and Telecommunications at Sapienza University of Rome. NASA's Jet Propulsion Laboratory, a division of the California Institute of Technology in Pasadena, manages the Mars Reconnaissance Orbiter project for NASA's Science Mission Directorate at the agency's headquarters in Washington. Lockheed Martin Space Systems in Denver built the spacecraft. Collapse pits caused by dry ice sublimation and other clues suggest the deposit is in a dissipating phase, adding gas to the atmosphere each year. Soooo... Mars is experiencing global warming? What, didn't they get the memo about freedom and incandescent light bulbs and stuff? If the past from Mars start to look closer and closer to the future of Earth then we should start to worry.